May 2017 – I "SAM" THE TRUTH! More than it meets the eye, this woman depicted that ‘Love is not, always, holding hands side by side; it is looking forward in one direction’. 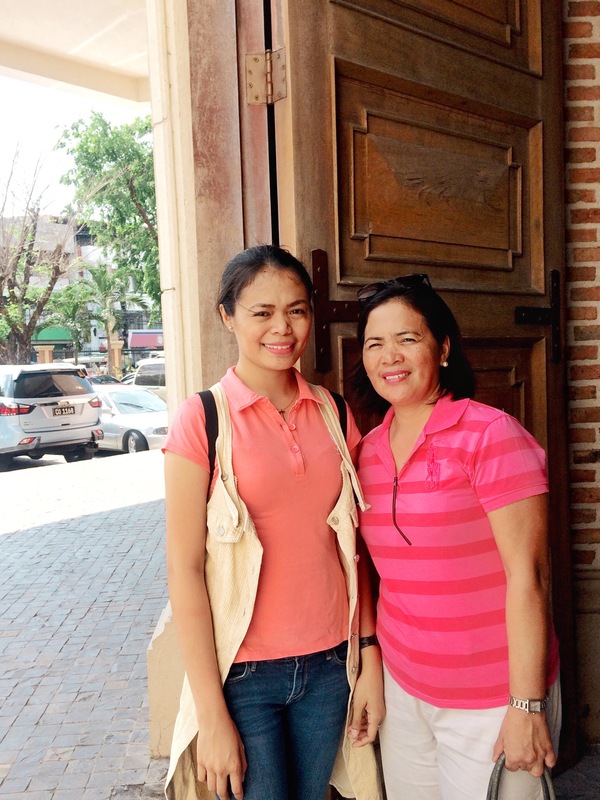 ‘Ma, who’d have thought we’d be closer to each other because of our devotion to God? During our younger years, I’ve seen how a woman – a spouse and a mother, grow from a diligent worker to a selfless servant. Those times, you’ve held my hand, along with Papa, every time we walk up the stage to pin my ribbons or receive my medals. Consequently, the wails of poverty were quashed by the hope of Divine Providence. Until I’ve reached the age of majority, slowly, I was led to the brighter side of life by knowing, deeply, who gave you to me – God. Again, we marched side by side, and walked up to receive my college diploma and honors. Here comes the age of maturity. The inevitable cannot overpower the love that we’ve grown. Our conversation over the dinner table involved matters that were, for me, blabbers in the past. It must have been the passing of years, or maybe, the brief moments of soliloquy by walking side by side, but you, a woman of simplicity, has, finally, helped me set my gaze straightforward. Thank you, Mama. If I’d live this life a hundred times, you’d, still, be the one I’d choose as my mother [if I ever get the chance to choose because, yes, I have high hopes God would, still, give you to me]. Let’s continue working onto the next life. Author samofguzmanPosted on May 15, 2017 May 25, 2017 Categories UncategorizedLeave a comment on Happy Mother’s Day! Is “GOD”, “human” or “Satan” in control of everything in this world? Let me share you this slippery-slope-kind-of-questioning-we-encountered today. Along our usual afternoon track, we stopped at a nearby bench at the beachfront to quench our thirst and eat quail’s eggs. Suddenly, two young adults holding familiar pamphlets approached us (Of course, this idea of Christian Protestants is no longer new to my sister and I because some of our acquaintances do the same kind of mission). “Do you mind if we get a short hold of your time?” The young man asked. A young woman was beside him, smiling, sweetly. I was thinking of a tactful way to answer them “NO” so as not to offend them. As a speaker, I can feel the same pang of hurt when rejected. “No, of course, not.” My sister, always, hospitable, answered. NO! I didn’t even have the chance to say that. Truth be told, I don’t want to immerse myself, again, with vague interpretations of Bible verses. I’ve had enough. That’s why I committed myself to carefully picking the right references to deepen my faith while holding on to what is true. Our charismatic community speaker advised us to refrain those kinds of short conversations, if possible, because they detract us from the true faith – the Catholic faith. These kind of evangelization can’t attain its purpose because interpreting the Bible by portion, just like any other law, is not right. The Bible must be interpreted as a whole. However, our archbishop said it’s okay to entertain them if we are strong enough to make wise comparisons in order for us to stay faithful to our Catholic faith. Yet, since my sister already acceded, then, I had no other choice than to be polite and welcoming, too. “Well, you can. We will not mind.” Then, I smiled. “There’s this question I want you to think about and answer: WHO IS IN CONTROL OF EVERYTHING IN THIS WORLD?” He handed me a pamphlet while he asked this question. It took me a long pause because I was trying to collate everything I’ve learned in my every day Bible-reading, Church teaching, prayer meetings, and conversation over the dinner table regarding God’s provision no matter how imperfect the world is. On the array of choices, only “GOD”, “human”, and “etc.” were included. Satan wasn’t included. So, I trimmed down my number of choices into those provided. Satan. This thought lingered my mind due to the slippery slope I was put onto. And because somehow, Satan is the father of all lies, I partly and temporarily believed. First, if Satan is in control of the entire world, then, we are succumbing to the final conclusion that we cannot do anything anymore. “Control” connotes “power”. According to Merriam-Webster Dictionary, control is to have power over. Hence, are we saying that we are slaves over Satan’s power? Remember Job. God “allowed” Satan to test him (Job 1:12). It was said, “God allowed…” That meant, it was, still, God who took control over the testing of Job. Not the devil himself because the devil hadn’t and will never overpower God (Luke 4:5-8). Second, the increasing evil attacks in the world even bolster God’s unending power. Why? Satan had to maximize all his efforts, work restlessly all day and night only to deceive both the faithful and the unfaithful – his ultimate job. When God’s voice and power become stronger, that’s when he deafens the world with his tempting and empty promises. When he does this, that means, God’s power is, really working (Job 9:4). Third, this evangelizer’s reference, “We all know that we belong to God, while the whole world lies in evil (1 John 5:19)” could be right, but it doesn’t coincide with the question they posed. According to Christian Community Bible Commentaries on 1 John 5: 19 (THE WHOLE WORLD LIES IN EVIL), First Edition by Claretian Publications, “As has already been mentioned, this world belongs to God who made it good. Nevertheless, this world is not simply a building site wherein we work. It is first the place where the evil one competes with God. The evil side does not side with any group, atheist or materialist or whatever else, but everywhere transforms the best things into destroying idols – even among those looking for a more perfect life life: keep yourself from idols (v. 21).” Hence, the devil, always, competes with God. He is the source of all that envy and jealousy, putting into human’s mind the urgency to win out of vain. Let us all remember that Satan wanted more than what God gave him. He wanted to be like God (Isaiah 14: 12-15). Lastly, upon Jesus’ resurrection, it does not only mean “to return to life” but to begin a new and transformed life (Christian Community Bible Commentaries on John 5:19 and John 6:60). To say that Satan, is, still, in control of the world, makes it pointless Jesus’ passion, death, and RESURRECTION. When he was raised from the dead, he has proven that sin and even death had no power over him. Hence, we, as members of Christ’s body, can conquer anything with him – even the stings of sin and the horrors of death. There is nothing that we cannot do because our hope, Jesus Christ, is alive! He is alive! Death as a consequence of sin had no authority over him because he himself was not subject to sin. Satan, then, is now overpowered by Jesus, our only hope. “Thanks for your time, Samantha and Ming,” said the young man who also happened to be a government employee. The young woman, again, smiled. “No problem.” Then, we vanished. As we rode our way home, I kept thinking about this incident. Since I’ve already undergone few confusions in the past regarding false ideas, I prayed before for God’s discernment and wisdom to know what is true or false not only through Bible verses, but through God’s communication in a language that we know and through the circumstances that surround His people. After all, God does not only communicate with us through Bible verses. He does it in human experiences. Furthermore, it is not apt to base our interpretation from verses of the Bible. It must be interpreted according to passages. You can download this Bible guide for the year 2017 – it was made by Bible scholars all throughout the world through thorough research and study of what transgresses time. It can be seen that our Bible readings are uniform; the 1st reading, 2nd reading and Gospel in Philippines are the same in all countries because the Catholic Church is ONE, holy, and catholic. Plus, the passages were well-chosen and they correlate with each other. Thank you for stopping by! I’ve got more to share to you.